The sounds of Crosby, Stills, Nash, and Young serenade excursion customers as they step aboard The Cat, Jim Trilling’s pearl white catamaran. Like entering the living room of a palatial home at sea, guests hand their shoes to Trilling’s crew. That’s so The Cat’s deck stays spotlessly clean. It’s hard to read Trilling’s eyes behind his ever-present sunglasses. What’s not hard to read is the smile that creases this Boston native’s face as he surveys the length of his 54-foot home away from home. 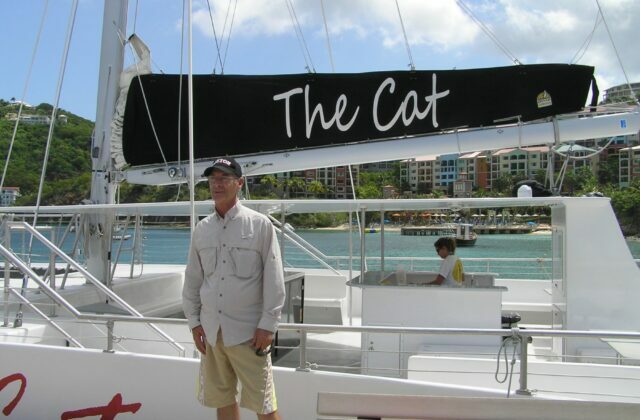 As long as guests are having a good time and The Cat is running seamlessly across the Caribbean Sea, life is good for the 64-year old Trilling. Two years removed from receiving a kidney transplant, Trilling lets his crew take charge. On this day, Trilling’s job is to make sure his paying guests feel special and relaxed. On today’s six-hour snorkeling excursion to St. John, the goal is to ensure pleasant vacation memories and vivid client testimonials. In 1980, Trilling departed from Boston on what he calls “a world adventure.” After spending five years building his boat by hand, Trilling’s goal was to sail around the world. Four days after embarking on his trip, Trilling and his crew encountered the “perfect storm.” Trilling’s 32-foot Westsail limped into the safe harbor of Hamilton, Bermuda, battered but not beaten. After a two-month detour rebuilding the boat dubbed “Windsong,” sails were set for the next leg of Trilling’s adventure. Upon arriving in St. Thomas in the U.S. Virgin Islands, Trilling’s life would reach a turning point. 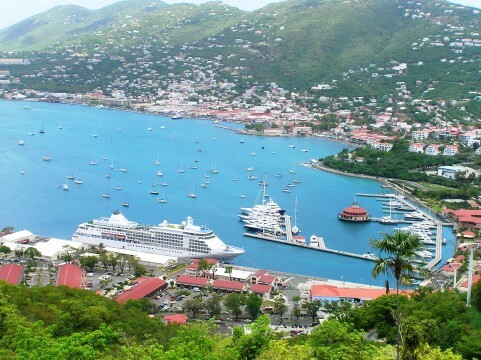 He concocted the idea of offering six-passenger sailing and snorkeling adventures to the handful of cruise ships that docked in Charlotte Amalie Harbour. With a business belief that “the worst thing they could say is no,” the former Brookline High School grad began knocking on doors of ship operators. “I called on cruise ships for about three weeks. Eventually the Cruise Director from Costa Cruise Lines agreed to offer my excursion, the “Windsong Sailing & Snorkeling Adventure,” to his passengers. Looking back, I guess this was my business break,” Trilling recalled. “One of my first customers was a news reporter from WGN television in Chicago. I took his group on a sailing and snorkeling adventure on my original 32-foot boat. At the time, this type of excursion was unheard of. The reporter gave a great testimonial about his trip to the cruise line. He also talked about his excursion on the air when he got back to Chicago. Costa Cruise Lines began regularly booking through me from this point on,” Trilling said. Three decades after his initial success in the boating adventure business, Trilling is firmly entrenched as an entrepreneur and resident of St. Thomas. Today, The Cat, and a second boat named Castaway Cat, are the centerpieces to Fun Water Tours. Trilling built and paid for these twin catamaran purchases in 2010 by continuing to knock on doors. His sales diligence has evolved into relationships that include four of the major players in St. Thomas commerce. Trilling believes these business relationships are the cornerstones for his enduring success. The Princess, Norwegian, and Costa Cruise Lines regularly work with Trilling’s company. 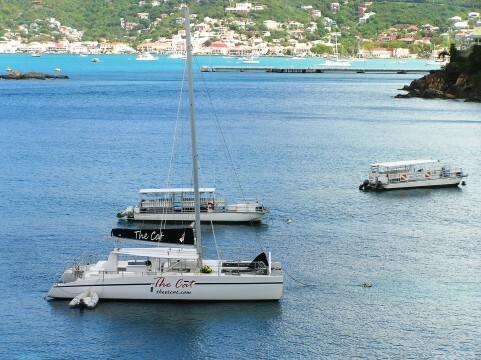 The cruise lines see The Cat and The Castaway Cat as a way to deliver intimate island experiences for their customers. Trilling sees his relationship with the cruise lines as mutually beneficial. “They depend on us to create memories for their passengers, and we depend on them to pay our bills,” Trilling said. The fourth major spoke in Trilling’s business wheel is the Marriott Frenchman’s Reef Resort, located on a bluff directly above the spot where Trilling docks his boat and picks up customers each day. “This beautiful hotel is a 37-year old landmark and one of the most famous places on the island. The cruise lines and the Marriott are the reasons I could build The Cats. I’m very grateful to have these relationships. I believe the cruise lines and the Marriott feel positive about the job we do. After an excursion, we return their customers feeling happy and satisfied. It’s a win-win,” Trilling said. In 2009, Trilling headed back to Boston to undergo dialysis and ultimately receive a new kidney donated by a friend. 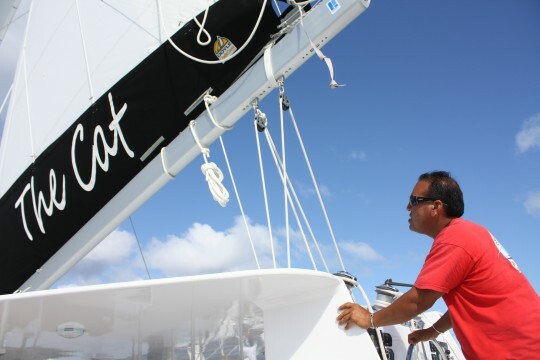 His crew took over the keys to his boats and his business. “My job is to secure new business, write up contracts, and pay the bills. My crew runs the business. They definitely did that when I got sick,” Trilling said. The loyalty of The Cat crew runs deep. “I’ve got employees who always show up and rarely call in sick. I’m a lucky guy,” Trilling said. What’s interesting is the hiring of future employees isn’t done by Trilling. He delegates this responsibility to his captain, Joe Morgan. The Denver native has worked for Trilling since he arrived on St. Thomas five years ago. Yes, on an island that is one of the rum capitals of the world, guests can tell friends they were on a boat navigated by Captain Morgan. The other key member of The Cat’s team is Becca Lee, a 28-year old native of Dallas. Lee, The Cat’s snorkeling director and resident chef, showed up in St. Thomas with only the promise of space on a friend’s couch. Lee revealed that networking and finding a job in St. Thomas is done the old fashioned way, in a bar. “I met Joe Morgan at a bar here called the Rum Shack. I explained that I had no experience working on a boat. Joe said this business is more about personality and a good work ethic. He said I’d get trained to learn the boat business. That was four and a half years ago,” Lee said with a smile. Trilling offers a different slant on what business he’s in. He believes The Cat and its crew are in the entertainment business. The truth is that life on The Cat isn’t just fun and games. The goal is to keep the Fun Water Tours business buoyant. This often means booking and running up to three excursions per day. So if an evening sunset cruise is on the calendar, the crew arrives home after dark feeling satisfied, yet spent. The luxurious Cat is Trilling’s reward for surviving his kidney replacement procedure. “The Cat is the last item on my bucket list. When I was on dialysis and working up to receiving my transplant, I decided money doesn’t belong to you until you spend it,” Trilling said. One doesn’t need to see Trilling’s eyes behind the sunglasses to see that he was beaming from this confession. The story behind how a boat got its name can be revealing. “The Cat’s” moniker awakened Trilling in the middle of the night. “I woke up one night and the name came to me like it was out of a dream. 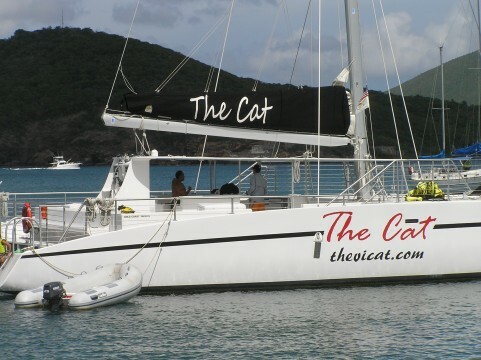 Here in St. Thomas, at least half the new customers will say they want to go on a cat, rather than a catamaran. I figured that for those customers who weren’t sure which boat they wanted to go on, I would have them covered,” Trilling said. More than 30 years since departing on his “world adventure,” Jim Trilling is still living the dream. It’s amazing the business you can build, the people you can meet, and the life you can experience if you just knock on a few doors. Tim Cotroneo is a freelance writer from Lino Lakes, MN with a passion for travel and a future Caribbean zip code.